My dad’s Christmas list has been produced. This is always an interesting moment. For his birthday, dad asked for a “moisture-meter.” We were a bit alarmed but apparently this is an essential tool for anyone obsessed with their log pile. Just a few days after the birthday I had a text from my brother letting me know that dad had been round to inspect his logs too. And after a month of in-depth analysis dad has changed both his log supplier and his special rotation system that used to involve transferring logs between various supposedly incrementally dryer locations before they finally reached the log basket in the porch. I have not been deemed sufficiently proficient by my family to navigate the various gadgets and equipment on the Christmas list so have been busy ordering wine instead. A case (well, 10 bottles) of Le Petit Caboche (yapp.co.uk, £8.95), a gorgeous grenache-based red from the Vaucluse. It’s made by the mayor of Chateauneuf du Pape, apparently. This will be our go-to red all-rounder and there should be enough left to run into January. Two bottles (those two spaces in the case) of Domaine Richeaume Cuvée Tradition 2010 France (yapp.co.uk, £17.25), a heady red if ever I tasted one. It’s a have your cake and eat it wine, with cabernet sauvignon for firm architecture and syrah for dried-herb-scented wild pleasure. 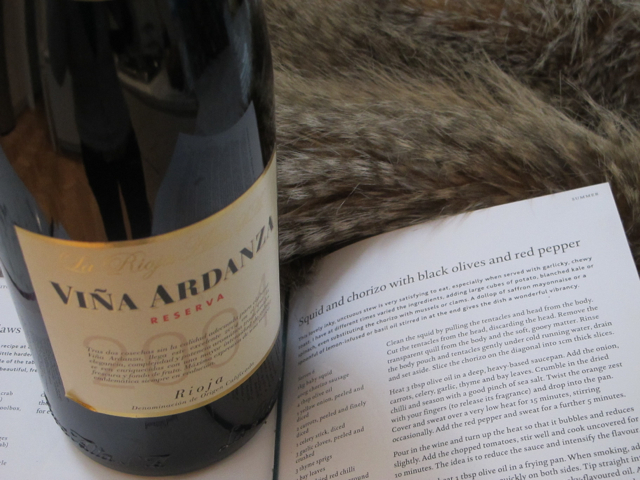 A couple of magnums of La Rioja Alta Vina Ardanza Reserva 2004 Spain (Majestic, £37 for a magnum). This is a simply glorious rioja, just coming into its own in a melt of tobacco and old leaves. These bottles are a treat and will stay at home in London so I can open them with friends as we roll into January. Pouring wine out of a double-sized bottle always feels special. I opened one recently for a Saturday lunch (we drank it with Skye Gyngell’s Squid and chorizo with black olives and red pepper) and everyone loved it. All the above are wines I recommended in the Telegraph. Click here for the full list of my Best Wines for Christmas (though it doesn’t include all the fizz, just a couple of them).